There is nowhere quite like Anchorage, the biggest city in Alaska, the wildest state in the U.S.. Rent a car in Anchorage and you will be able to explore mountains, glaciers and a ski resort as well as many miles of parks. You will easily be able to reach all of the places of interest with ease. When you visit Anchorage you will want to be flexible with your plans when you see all the attractions that are on offer. 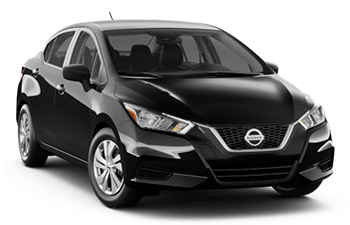 Finding a rental car in Anchorage is straightforward and you will be in complete control with many options to make sure you get the transport solution you need. Hire a car for the long term in Anchorage and explore the sights in the wider Alaska area, or drive just one way from Anchorage and drop off your vehicle at a different location. Ted Stevens Anchorage International Airport 5000 W International Airport Rd, Anchorage, AK 99502, U.S. 05:30 a.m. - 02:30 a.m.
City Office 854 E 36th Ave, Anchorage, AK 99503, U.S. 08:00 a.m. - 06:00 p.m. Whether you are looking for shopping opportunities, fine dining, skiing, or simply natural beauty, when you rent a car in Anchorage you will have plenty of options. Here are some of the city's best attractions which can be accessed with a cheap car rental in Anchorage. Most people who visit cities have to travel for many hours to reach areas as beautiful as Chugach State Park. For those with a rental car in Anchorage you will only need to drive for twenty minutes. This is the third largest state park in the country and it boasts an incredible amount of recreational opportunities, with over 450 km of hiking trails alone. You can also cycle, view glaciers, take a ride on a snowmobile and see bears, moose and 40 other species of mammal. Come to Anchorage, rent a car and head to the city's primary cultural hotspot, the Anchorage Museum. This top rated museum features a fascinating insight into the history of Anchorage and Alaska and also has an interactive area for children and its own planetarium. All in all it is a great introduction to Anchorage and the state of Alaska. This trail is easily accessible by car and offers an enjoyable stroll complete with stunning views of Anchorage and the mountain backdrop. On this walk (or cycle) you will pass two of Anchorage's most famous locations, the Oscar Anderson House and Earthquake Park, before ending in Kincaid Park with its photo worthy views. Anchorage might be a large American city but it is not a typical one. If you go to Anchorage and rent a car, you can expect easily navigable roads which are wide and with well signed speed limits, making it even more straightforward. You may encounter some difficulties if you visit in winter and have never driven in snow before but this does not take long to get used to. Take care when driving out of the city and into more rural, mountainous regions. Driving in the mountains is not the same as driving in cities and may also take some time to get used to. As is the case in the rest of the United States, driving is on the right hand side of the road.